Whole wheat flour is ground from complete wheat berry including the wheat bran. Whole wheat flour has higher fiber content, protein and fat in baked goods. 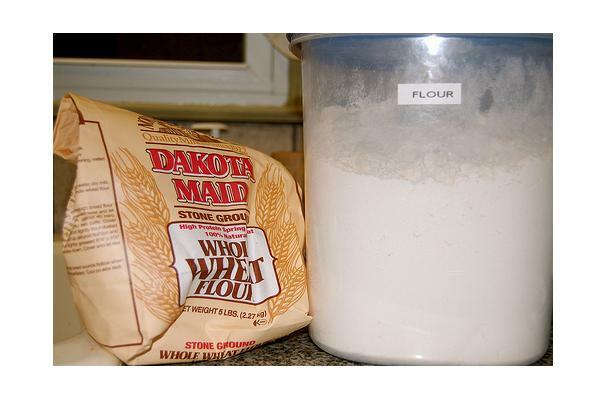 Since the whole wheat flour contains the whole grain, the resulting flour has a textured, brownish appearance. Choosing: Wheat flour, berries and bulgur are generally available prepackaged as well as in bulk containers. Just as with any other food that you may purchase in the bulk section, make sure that the bins containing these wheat products are covered and that the store has a good product turnover so as to ensure their maximal freshness. Whether purchasing these products in bulk or in a packaged container, make sure that there is no evidence of moisture present. Look for wheat germ that is packaged in sealed containers (especially those that are vacuum packaged) as they will be more protected from potential oxidation and rancidity. Buying: Whole wheat flour is readily available in supermarkets and in online stores, although it costs a little more than bleached flour. Wheat flour is mostly used in baking. Wheat bread are often suggested by specialist because it is much healthier than other types of bread. Wheat berries should be stored in an airtight container in a cool, dry and dark place. The optimal way to store wheat products such as flour, bulgur, bran and germ is in an airtight container in the refrigerator as the cooler temperature will help to prevent them from becoming rancid. Today, the largest commercial producers of wheat include the Russian Federation, the United States, China, India, France and Canada. History: Wheat is an ancient grain. Thought to have originated in southwestern Asia, it has been consumed as a food for more than 12,000 years. As it was looked upon as the Staff of Life, it played an important role of religious significance and was part of the sacred rituals of many cultures. Greek, Roman, Sumerian and Finnish mythology had gods and goddesses of wheat. This exceptionally nutritious grain is still considered to be sacred in some areas of China. Wheat was not native to the Western Hemisphere and was only introduced here in the late 15th century when Columbus came to the New World. While wheat was grown in the United States during the early colonial years, it was not until the late 19th century that wheat cultivation flourished, owing to the importation of an especially hardy strain of wheat known as Turkey red wheat, which was brought over by Russian immigrants who settled in Kansas. As rice has been the dietary staple of Asia, wheat has served this role for many of other regions of the world. It is estimated that approximately one-third of the world's people depend upon wheat for their nourishment.